Multiple ramp profiles, Pump-FlexTM Decel and advanced motor protection make the VMX Series soft starter adaptable to a wide variety of AC motor applications... no need for add-on modules or costly auxiliary devices. Compact packaging has become critical in more and more electrical installations. 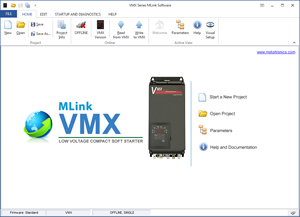 The VMX Series meets this need without compromising features and ratings. By using a highly engineered packaging design and the latest generation microprocessor, all the control and protection features you need are in the VMX Series. 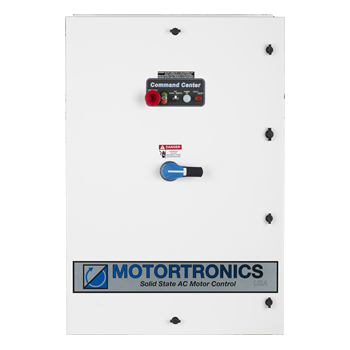 Narrow and shallow dimensions are perfect for integrating the VMX Series into motor control centers (MCCs), pump control panels, and retrofit starter enclosures. Integral Bypass Contactors are standard on all sizes and provide maximum efficiency of panel space while maintaining the Motortronics reputation for being able to soft start most any load. The VMX Series is the only fully integrated, compact, world-class design offering uncompromised power and control capabilities. Call us for pricing and availabilty. 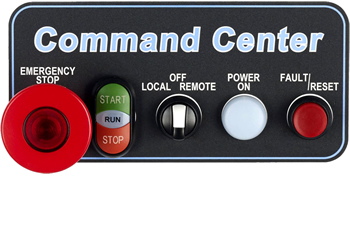 The Command Center Interface allows for basic Functionality and Diagnostics. motor overload protection needed during the run time. Reset: Manual or automatic, selectable via programming. when the motor is not running. Residual current method with adjustable trip delay. time between starts lockouts. Restart delay after a power failure. shorted load prior to each start. or bypass contactor is welded closed. Phase rotation trip can be set to A-B-C, A-C-B or disabled. Remembers the thermal condition of the motor even if control power is lost. Thermal Register is adjusted for Off-Time when power is resumed. Overload Trip will not reset unless motor has regained enough thermal capacity based on learned motor starting profiles. Trips on any phase under 20% of Voltage. Sequence selectable A-B-C, C-A-B or Off. Any phase voltage over trip level Of or 1-10% of set voltage, w/1-20 sec. delay. Under or Over kW trip or alarm Off, or 20-100% motor kW, w/1-20 sec. delay. Electronic Residual current protection method, no additional CTs needed Setting: Off, 5-90% of CT w/1-60 sec. delay. Programmable maximum starts-per-hour to prevent exceeding motor limits. Setting: Off or 0-10 start / Hr. Service Factor setting automatically adjusts other settings to compensate. Adjustment Range: 1.0-1.15 SF. Off, or 1-30% of set voltage 1-180 second startup time. Leading or Lagging PF, trip or alarm Off, or 0.01-1.00, lead or Lag w/1-20 sec. delay. Peak Current quick trip (electronic fuse) Trip level: Off or 800-1400% FLA, with .1-.5 sec. delay. Used with or without Start-per-Hour protection to prevent short cycling of motor Setting: Off or 1-60 minutes between starts. Start Curve can be set to Class 5-30 Run Curve can be set to Class 5-30 Automatic Full Speed detection and change over. Provides monitoring of phase-to-phase current levels and trips if imbalance exceeds setting. Setting: Off or 1-30% FLA w/1-20 sec. delay. Load-Loss /Loss of Prime protection Setting: Of or 10-90% FLA w/1-60 sec. delay. Off, or 1-30% of set voltage 1-20 second trip delay. Back Spin or Anti-Wind Milling protection Prevents Restart after Stop Command Time Setting: Off or 1-60 min. Programmable delay for restarting after a power failure for use in multiple installations. Setting: 0-999 sec.